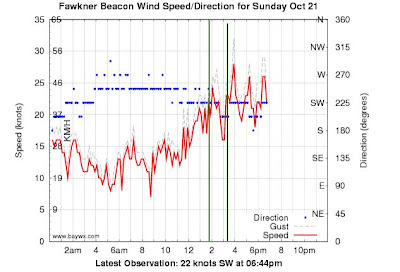 A sea breeze - or at least some consistent wind - at last! The forecast westerly came in on schedule during the late morning. I headed down to Hampton after lunch and rigged up my Switchblade 10 and the Sector 60 board. I put some clothes, money, phone and sandals in my waterproof backpack as I planned to go for a tour. Good wind on the water. I took off immediately heading north along the bay. The Sector 60 cruises well. I was able to get all the way to Port Melbourne, right up to the Spirit of Tasmania, on a single tack. The rolling swell was fun to ride but I was mostly travelling across it. I left the other kiters at Hampton "moving the lawn" (going back and forth) and reveled in solitude about 700m offshore. It was a long way on a single tack. I was conscious to rest my rear leg and straighten it, and I stopped twice briefly en route. 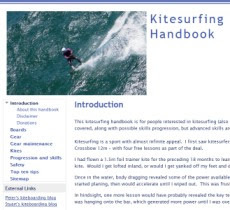 There were quite a few kiters at Brighton too, but less at St Kilda. I de-powered the kite for the last 1km coming to Port Melbourne. The wind dropped a bit on the way back the wind so I toggled on full power. I did one run into Brighton among the madding crowd, then back out, past Green Point and on to Hampton. The wind strength increased again at Hampton and I was rather tired so I came in. There were lots of kiters on the beach - the season is getting into full swing now.